The Schoeps Colette Series microphone system is popular among professional field audio engineers. The gray modular CMC6 preamplifier and MK41 supercardioid capsule provide a professional alternative to shotgun microphones when recording dialog indoors. The system is based on the modular CMC6 preamplifier and MK series capsules which are capable of wide, linear frequency response curves and superior audio quality. This system includes the CMC6 preamplifier, MK41 capsule, SG20 microphone mount, B5 pop-filter and case. The CMC6 Preamplifier features Class-A transformerless electronics, resulting in a very low noise floor and lightweight. The high impedance input signal of the modular capsules are accurately converted to low-impedance energy, allowing for long cable runs without noise and radio frequency interference. The MK41 Capsule is a supercardioid condenser capsule with a wide frequency range and high SPL handling. The supercardioid capsule is effective in minimizing noise and ambient audio at the off-axis sections of the microphone capsule. The microphone system is more than suitable for crucial capturing of dialog and ambiance for film, professional video and professional audio applications. The CMC6 is designed to be used with any of the Schoeps Colette series modular capsules. The capsules provide various polar patterns and frequency response curves. The CMC6 modular power supply features transformerless Class-A electronics that result in a linear 50 Hz to 20 kHz frequency response. The superior quality of the capsule and preamplifier result in detailed, pristine audio quality with a very low noise floor. Box Dimensions (LxWxH) 8.75 x 5.6 x 3.25"
Colette Series Supercardioid Microphone Set (Gray) is rated 4.9 out of 5 by 16. Rated 5 out of 5 by Anonymous from My 'go to' microphone! Purchased this microphone from B&H in 2016 and have been using it for the past year for both indoor and outdoor interviews. I had done extensive research before purchasing this mic. I thought other similar microphones sounded ok, but always kept coming back to this mic because of how natural it sounded. When listening to the audio that was captured it sounds like you are directly there in person. It does not add any frequencies that make it sound ununatural. The included wind filter is ok, but I ended up buying a Rycote blimp with a dead cat and it becomes more versatile. I know this microphone is expensive... but this mic gets the job done and stands well above the rest in my opinion. Rated 5 out of 5 by MC Mechanic from Well worth it! We were using the Audix SCX1-HC as our indoor/studio/interview or narrative microphone. On the 1st interview we shot with the MK41, the difference was between the two was apparent. The MK41 sounded natural and full. The 2nd time we shot on a hard cyc cement floor studio - the result was amazingly natural sounding. This was my go to dream mic and now I finally have one. With so much tech depreciating at a an alarming rate - the MK41 is a great investment. Rated 5 out of 5 by Michael from Best Super-Cardiod I have ever used This is the most pleasing sounding mic I have ever used! This mic is not best used in every situation but when called for it is the best sounding mic on the market. I do a lot of interior interviewing where I can not prep my surroundings with carpets or drop clothes, so occasionally you get a lot of reverb. This mic is the only mic that I have used that cuts down on a lot of that reverb while maintaining a very natural sound to the persons voice. It's pricy but well worth the extra cash. Rated 5 out of 5 by TQL from The Dialog Microphone The MK41 capsule has an extremely flat response from 200 Hz to 15k Hz with a slight roll off outside those frequencies. There is almost no coloration added to the sound. Combine this with a super-cardioid pattern and you have a near perfect microphone for recording dialog indoors (which is why the CMC641 is found on so many film sets). But the CMC641 is also an excellent microphone for recording musical instruments, ambience, foley, and so forth and for the same reasons: flat response and no coloration. Having said all this, the microphone is sensitive to handling noise and that includes vibrations transmitted up the cable to the body. Because of this, you will want to hold the microphone in a good shock mount that isolates the cable from the body. The microphone is also sensitive to wind noise -- even the slight wind current from a door being opened or just moving the mic itself will cause flutter. So in most cases you will want to use at least a pop filter. For something more like a breeze, you will want to use a blimp (probably with a dead cat for added protection). A few people have reported humidity issues with Schoepps microphones. In particular, a motorboating noise effect can occur under certain high humidity conditions (either from swamp-like conditions or by moving from dry-cold to warm-humid). The humidity issue seems to be so infrequent and random that it is very hard to pin down. There seems to be no consistency among the microphone models, environmental conditions, causes, or cures. In my case, I have not experienced the humidity issues -- but then I have not subjected the CMC641 to environmental abuse either. In order to get the most out of the CMC641, the rest of your signal chain will have to be high quality as well: this is a professional microphone and demands professional quality mixers/recorders/cables. (I use Sound Devices mixers/recorders and the results have been outstanding.) The Colette Series Microphone Set being reviewed here has the body, capsule, pop filter, mic stand mount, and foam-lined wooden case for a price less than the individual pieces bought separately. That's good news. The wooden case is nicely made but is more of a display case and has a latch guaranteed to pop open just when you least expect it to happen. So for bashing around recording location sound, you will probably want to swap the case out for something a little more sturdy. Keep in mind that the CMC641 is just an audio tool. And like any other tool, you need to select the proper tool to use for the job to be done. Rated 4 out of 5 by bartbee from It Does exactly what it's meant to do. The Schoeps SCCMC641S is a great indoor mic for recording dialogue/interviews. It has a superior sound compared to a conventional shotgun mic due to the attenuation of low frequency reflections/reverb that often occur when recording inside. This results in a more direct, cleaner sound. The supercardiod capsule is very directional for such a small mic. 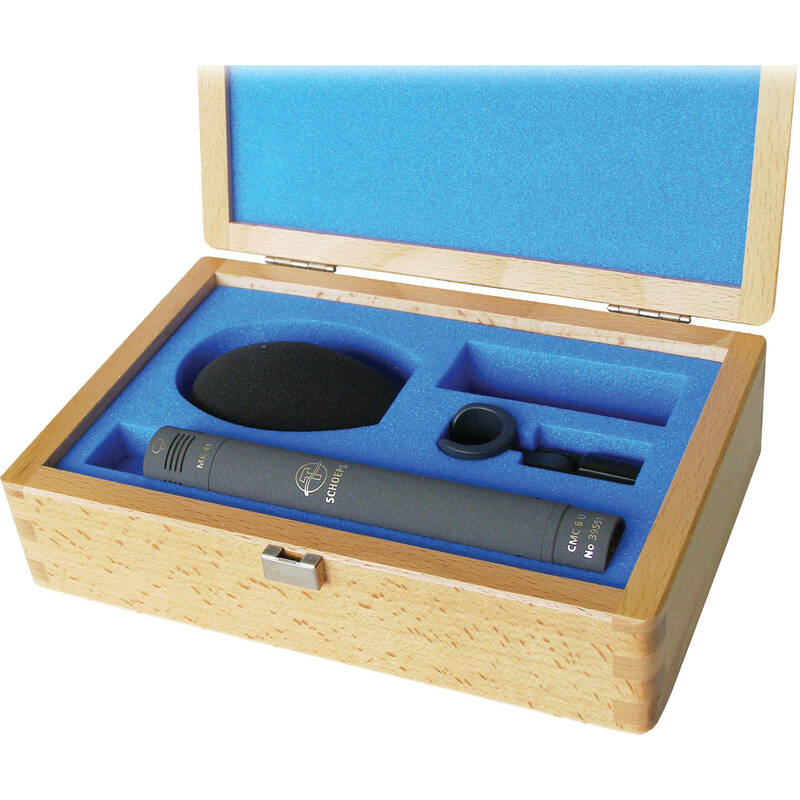 The mic is well protected in a strong wooden box which also contains a foam mic cover and mic clip. The foam cover does not reduce wind noise that well when swinging the mic on a boom. A furry cover is needed if you want to use the mic in that situation. This is a professional piece of kit that sounds great and is solidly built. Rated 5 out of 5 by Stephen from Love the way this mic sounds Mic sounds amazing. Using this mic on a boom for video interviews. Sound is crisp and clear but doesn't lack any low end either. Sounds amazing with a Sound Devices 302 mixer. Rated 5 out of 5 by Brian Maurer from 10 Seconds is all you need 10 seconds of working with this microphone was all I needed to feel comfortable with the price of this superb microphone. I've been working with it with my SD 744t, and love the sound, the pickup and the quality of this microphone. Serious audio technicians and audiophiles will love what this mic can do for you. I've been working with shotguns and a range of mid range gear, and I have to say, I'm sad that I waited all this time to purchase this mic. I was a little surprised at how small it was, physically, but otherwise, it works great. Did an outdoor shoot in moderate wind; you'll want something stronger than the windscreen that it comes with, as it didn't do much to reduce the noise. Overall though, I love this mic, will recommend this mic to anyone, and will continue to look forward to the next shoot with it. Rated 5 out of 5 by Ian B from Wow...amazing mic, but steep price I am not a professional. However, I do enjoy professional equipment. This mic with the MK41 capsule is stunning. Blow your mind stunning. I am coming from an AKG se300b with CK93 hyper capsule, and it was a great mic, but NOTHING compared to this mic. First off, it is TINY, like a dry-erase marker TINY. IT fits in my camera bag perfectly, and who doesn't like smaller better gear? (and yes, the price would suggest this) I am a little worried about the handling noise, and the humidity issue, but running it into my Sound Devices 702 is a pleasure. Incredibly transparent. Highly directional (but a bit forgiving if you aren't pointing the mic EXACTLY where someone's mouth is) The handling noise is a little rough, but as long as you have your cable tied down, and stuff doesn't move, you get super rich sound. If you have the cash, I don't know if there is a better all-around professional mic. TheCMC 6U is the a CMC 6 preamplifier that operates with phantom power. There are other CMC 6 models of this preamp that can operate with batteries or connect to wireless systems. What is a good schock mount/suspension holder to fit this microphone? I realize this mic is predominantly used indoors, but if I am in a situation where I need to use it outside, what product to reduce wind effect will fit this mic? Thank you for the advice, everyone. I appreciate your help.